Amberjacks are a great fish that we have available to our Ft. Lauderdale fishing charter customers here aboard the Marlin My Darlin on an almost year round basis in Ft. Lauderdale, but spring and summer are the best seasons to tangle with one of these bruisers. Greater Amberjacks are the really big boys, with Lesser Amberjacks and Almaco Jacks being smaller as a rule but just as tough pound for pound. Greater Amberjacks average about 30 to 35 pounds here. Fifty pounders are not at all uncommon and an occasional fish in the 80s or bigger is caught. I’ve seen a couple over 100 pounds but those were monsters and aren’t really available unless you find yourself at the end of a rainbow. Any structure will hold these fish but they really like a high profile the best and for that reason our Fort Lauderdale fishing area shipwrecks, whether naturally on the bottom or placed there thru our artificial reef program, hold the most fish. The majority and most productive wrecks (mostly ships and boats, but an occasional plane or barge) are located anywhere from 150 to 350 feet, but we catch fish on some spots as shallow as 45 feet and others on really deep wrecks over 400 feet down. 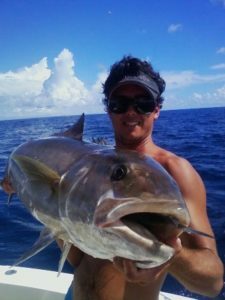 We like all the Jacks available to us here, but the Greater Amberjack who carries the fitting nickname of “Reef Donkey” is our favorite by far. Bigger is better when it comes to Jacks and a big “AJ” will give it all every time and you will have the memories of the sore muscles and violent fight when his name pops up again. And he pops up again and again for us. These Amberjacks are great fun and a welcome member of our deep sea fishing catches here in Ft Lauderdale. When targeting Amberjacks the best baits are fished alive. They will take a dead bait, and we catch them on lead Bulletthead and Butterfly jigs, but it’s hard to beat a live bait for Amberjack fishing. The very best bait in our opinion is a small “bullet” Bonito. A frisky Tinker Mackeral or Speedo are great baits also, and will get bit as well, but often not quite as quickly. When you are dropping a Bonito on a wreck holding fish you better be ready to engage the reel as the bite can come very quickly. When the Amberjacks are”stacked up” on a wreck during high season almost any live bait will get their attention whether it be a Goggle Eye, Blue Runner, Pinfish, or even a Snapper or Grunt. Circle hooks are the choice here as we release the vast majority of these fish and the circle designed hook does minimal damage to the fish in comparison to a typical “J” hook caught fish. You can go as light as 60 pound leader, but the heavier the better, with 80 to 100 pound mono being much safer, and often drawing plenty of bites despite the heaviness of the leader. We kick it up to 125 lb. when the fish are really biting and with that for leader, some braided line and 50 pound class tackle you can really lean into it, and Mr. amberjack will pull back just as hard. If you jig these fish on lesser conventional tackle or spin a lighter leader is in order, but be prepared to lose a few as structure such as a high profile wreck will present cut off issues as the Jacks get their head down and drag across the wreck. Almost all our AJs are caught close to the bottom on deeper wrecks here but we do catch some on shallow structure, and occasionally on the wrecks in less than 60 feet of water we take a fish off the surface. We love it when the Amberjacks are in town. A big Reef Donkey with an attitude will test you and your tackle and remember catch and release is best. If you wish (at present) you are allowed to keep one per FWC.